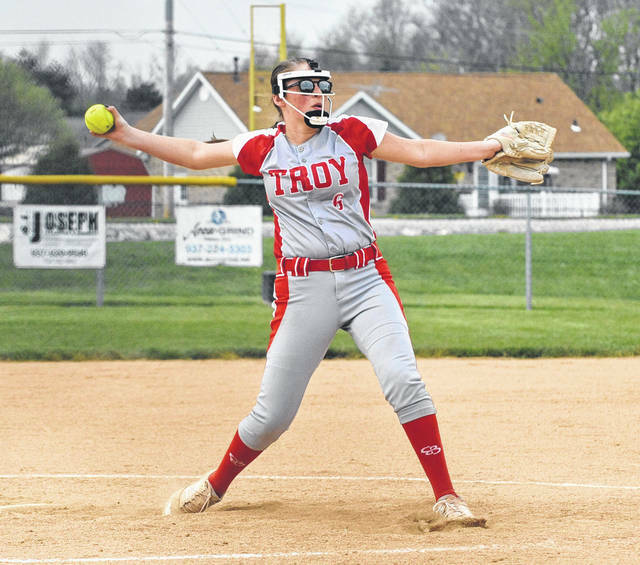 Josh Brown|Miami Valley Today file Troy second baseman Josie Rohlfs returns to anchor the Trojans’ infield this season. 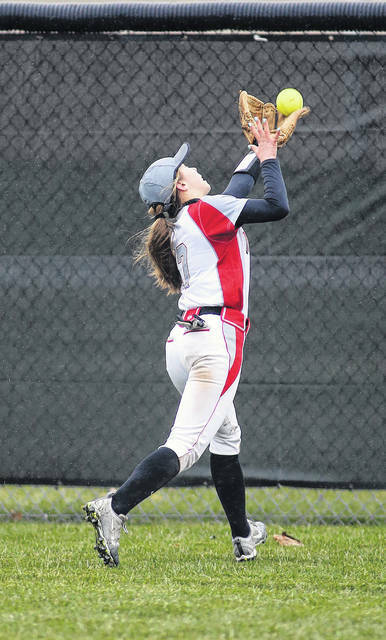 Lee Woolery|Miami Valley Today file Troy center fielder Megan Malott chases down a fly ball last season. 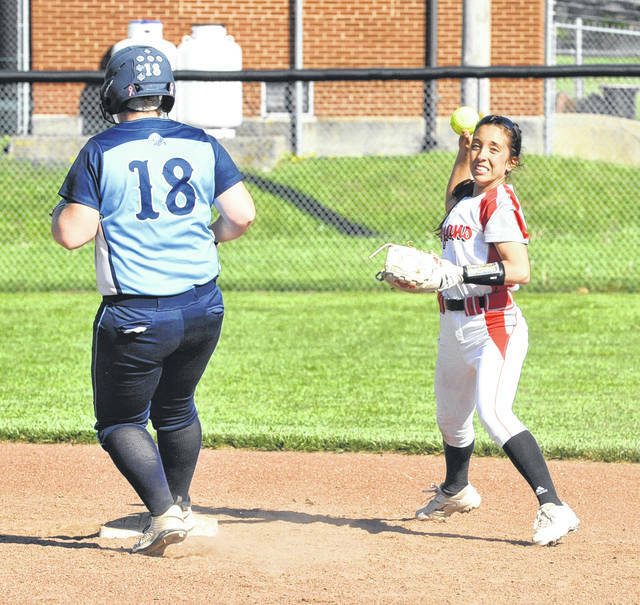 Lee Woolery|Miami Valley Today file Troy’s Madelynn Lavender makes contact during a game last year. Josh Brown|Miami Valley Today file Erica Keenan returns to head up Troy’s pitching staff this season. TROY — The Troy softball team knows exactly what it wants to accomplish. And step by step, the Trojans plan on knocking items off their list. And after going 15-12 last season and finishing second in the Greater Western Ohio Conference American North Division behind champion Greenville — which has at least shared the title every year since entering the division in 2011 — the Trojans know that, before talking about wins and losses, they need to address the chemistry in their own dugout. “The girls have put together a list of goals and stretch goals coming into the season,” Troy softball coach Scott Beeler said. “First off, they want to come together as a team and build on their trust between each other. Getting 20 wins is also a big goal for them — that’s something that’s only happened once at Troy. And winning the sectional is another big goal of theirs — but the big one is camaraderie. And while the Trojans do have some youth on the team after graduating six seniors, including ace pitcher Hallie Snyder, catcher Kearston Riley and shortstop Savannah Nelson, there is plenty of experience back in the lineup, as well. Leading the offense is junior first baseman Tia Bass, who led the Trojans in batting average (.542), home runs (six) and RBIs (30) last year. And defensively, senior second baseman Josie Rohlfs and senior center fielder Megan Malott will help ensure that the Trojans remain consistent in the field. Malott was a first-team All-GWOC American League selection last season, while Bass and Rohlfs were both second team selections. Senior Madelynn Lavender will be back in left field for the Trojans, as well, and junior Paige Nadolny — who was second on the team in home runs last year — will return at catcher. Senior Hannah Setser will also play catcher and infield, and seniors Skylar Kline and Kaitlyn McClure and junior Lexi Piper will add depth to the roster. The left side of the infield is unsettled at the moment, as junior Ella Furlong returns at third base but can play shortstop, with freshman Lauren Fonner potentially playing at short. “Ella came into her own at the end of last season, and she’s such a good third baseman,” Beeler said. “She can play short also if she has too, and right now we have a freshman at short in Lauren who hits well and plays the field well. To me, third is the key position in the infield — you need to be able to play the bunt and be ready for some rockets — and Ella is so good there for us. And with Snyder gone, the No. 1 spot in the pitching rotation now belongs to junior Erica Keenan, who has seen plenty of innings over the past two season. Last year, she went 5-5 with a save and 37 strikeouts in 70-plus innings with a 4.96 ERA. Freshmen Fonner and Lilly James will also see innings this year, among others. Beeler also knows what a challenge unseating Greenville will be. The Wave have won at least a share of the title every season since 2011, only sharing it with Troy and Piqua in 2016 and with Piqua in 2013. “You’ve still got Greenville there, and we hope to be competing against them for the league title,” Beeler said. “Especially since this is it for the GWOC — next year, we all move into a new league. We want to beat them, but we also respect them. You have to believe that you can win, but you also have to respect what they’ve done. The schedule doesn’t do the Trojans any favors, either — after a tri against Milton-Union and Graham at home Saturday and a trip to Tennessee in the season’s opening week, Troy opens division play with Greenville on April 1 and 2. “We’re the lucky team that has to play Greenville first, but hey, everyone’s got to play everyone sometime,” Beeler said. “Last year we played a cold doubleheader where it was snowing in the second game, so we’re at least praying for some better weather this time. But we’re older and more experienced now, and the girls have worked hard all winter. 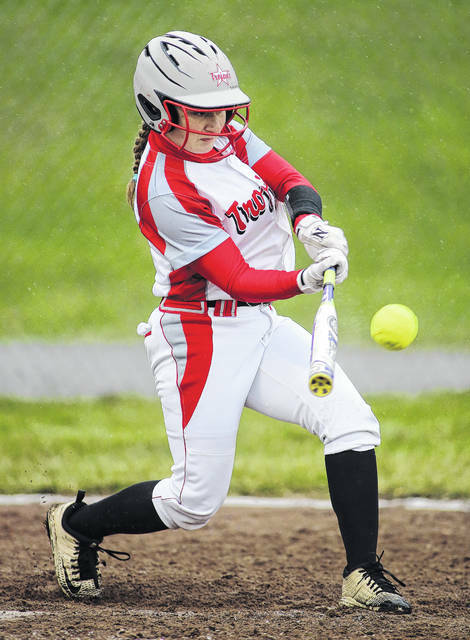 https://www.tdn-net.com/wp-content/uploads/sites/21/2019/03/web1_050718jb_troy_rohlfs2-1.jpgJosh Brown|Miami Valley Today file Troy second baseman Josie Rohlfs returns to anchor the Trojans’ infield this season. https://www.tdn-net.com/wp-content/uploads/sites/21/2019/03/web1_040718lw_troy_meganmalott-1.jpgLee Woolery|Miami Valley Today file Troy center fielder Megan Malott chases down a fly ball last season. https://www.tdn-net.com/wp-content/uploads/sites/21/2019/03/web1_040718lw_troy_madelynnlavender-1.jpgLee Woolery|Miami Valley Today file Troy’s Madelynn Lavender makes contact during a game last year. https://www.tdn-net.com/wp-content/uploads/sites/21/2019/03/web1_050218jb_troy_ericakeenan-1.jpgJosh Brown|Miami Valley Today file Erica Keenan returns to head up Troy’s pitching staff this season.